Gutters and downspouts are essential for preventing water damage, protecting entrances and moving water away from the foundation of your home. Even in the heaviest rainstorm there will never be a need to worry again. 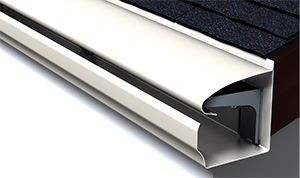 Our heavy gauge aluminum gutters will protect your investment and will never peel, crack or fade. Color coordinated all aluminum leaf guard professionally installed by Quality Builders not only looks good but prevent your gutters being clogged up by debris such as twigs, leaves and acorns. Rainwater cascading off an unguttered roof will hit the ground with enough force to cause a splash back. Within this splash back are dirt, grass and minerals that end up on the exterior of your home. Over a short period of time, a stain appears that can be difficult to remove or hide. Plants, flowers, mulch and soil located under the drip line of unguttered roof can suffer from the water runoff of the thunderstorm. Additionally, this runoff can result in an overwatering condition that permits harmful fungus to develop as well as attract ant, roaches and termites. A properly designed and installed gutter system keeps the soil surrounding your home at a consistent moisture level by directing roof runoff safely away from the house. A gutter guard is a piece that protects the exposed top portion of a gutter by preventing anything other than water from entering. 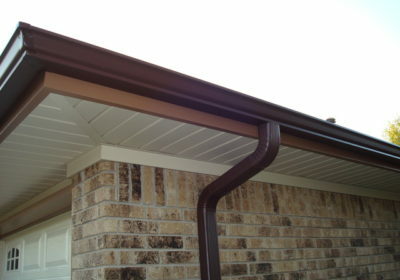 The hood is installed with the gutters and is made of the same material, and fit to the exact dimensions. 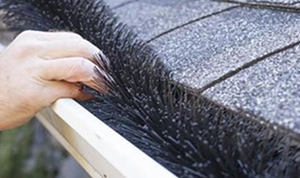 GutterBrush protects your rain gutter and keep debris out of the channel all year round. Once you install the GutterBrush Gutter Guard you will no longer have to deal with the danger and mess of cleaning the gutters yourself. The GutterBrush Gutter Guard also eliminates clogged and overflowing rain gutter systems that contribute to rot and water damage.